Asus had unveiled the Zenfone 3 series of smartphones at Computex earlier. Asus has now announced two new smartphones of this series, called the Zenfone 3 Laser and Zenfone 3 Max. These smartphones are the next iteration to the previous launched Zenfone 2 Laser and Zenfone Max. According to Techrum, these smartphones were announced at an event in Vietnam, but as of now there is no word on the global availability including India. The Asus Zenfone 3 Laser is priced at 5,990,000 VND, which is approximately Rs 18,000, which is a bit expensive when compared to the earlier version which was launched at Rs. 13,999. 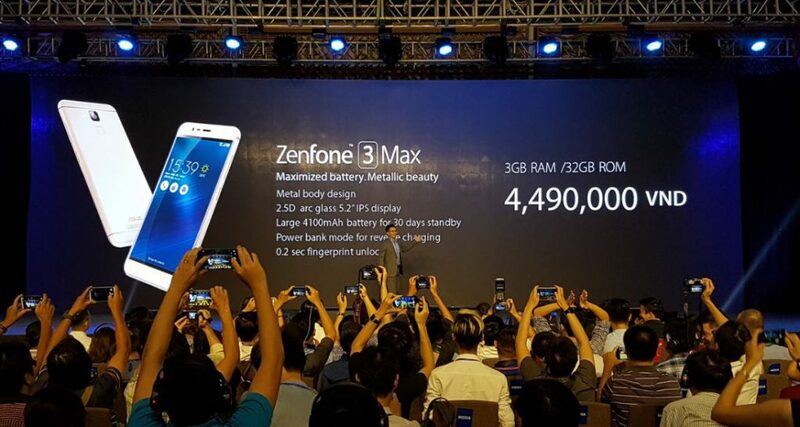 Whereas, the Zenfone 3 Max is priced at 4,490,000 VND, which is approximately Rs 13,400, which is priced quiet similarly to the previously launched version in India Rs. 9,999 for 2GB RAM model and Rs.12,999 for 3GB RAM model. Asus Zenfone Max is available in Titanium Gray, Glacier Silver and sand gold. Asus is being very aggressive in new launched recently they announced a new variant of Zenfone 3 Deluxe with Snapdragon 821 chipset just after qualcomm launched the new snapdragon 821 chipset. Then we saw the new ZenPad 3S 10 and now the Zenfone 3 laser and Zenfone 3 Max, although Asus has not shared the complete specifications of these two smartphones.